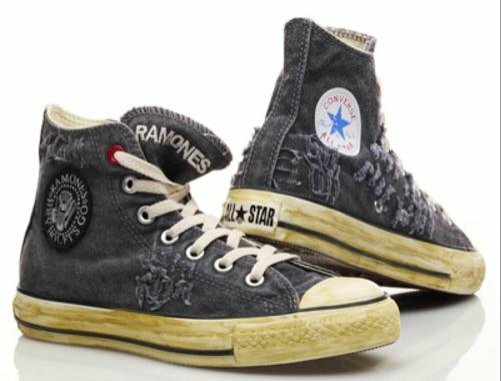 Photo gallery of The Ramones tribute high top chucks. 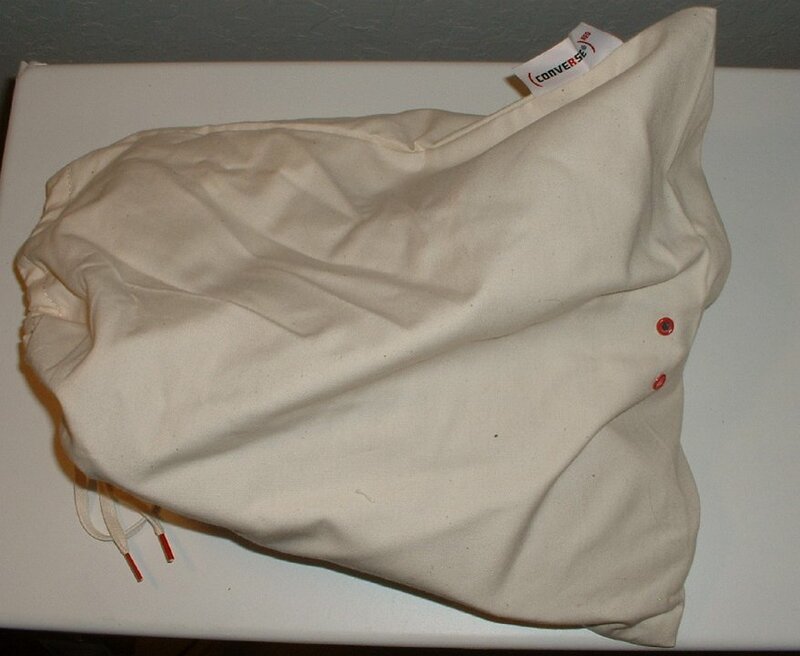 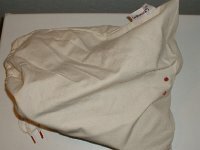 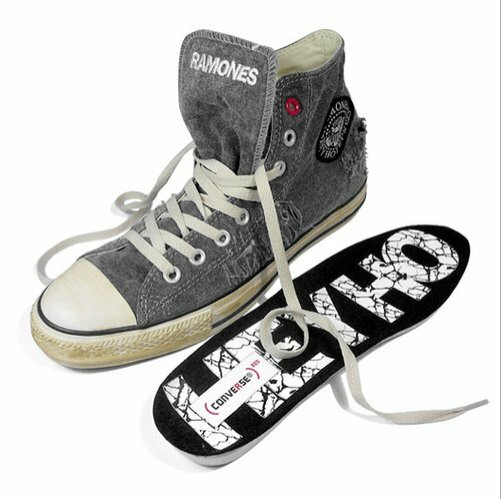 1 The Ramones High Top Chucks Product Red shoe bag holding a pair of Ramones high tops. 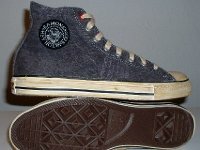 2 The Ramones High Top Chucks Inside patch view of a right Ramone's high top with hemp laces. 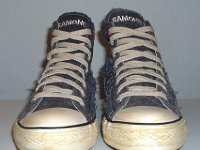 3 The Ramones High Top Chucks Outside view of a left Ramone's high top with hemp laces. 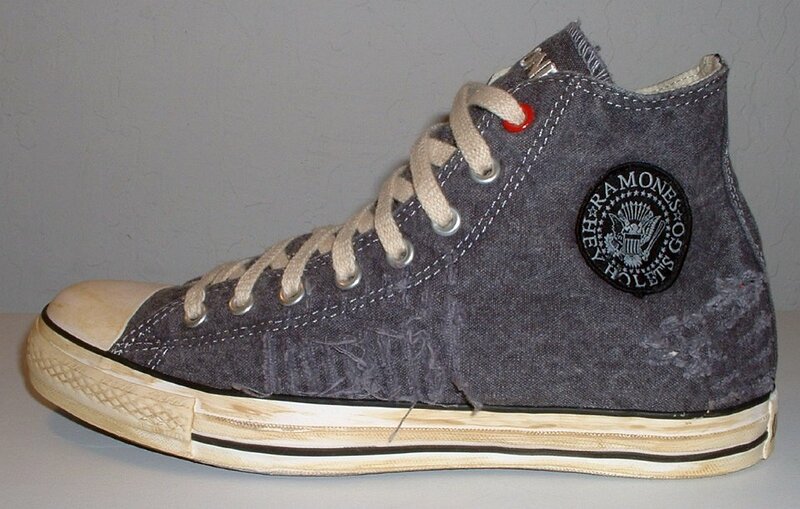 4 The Ramones High Top Chucks Inside patch view of a left Ramone's high top with hemp laces. 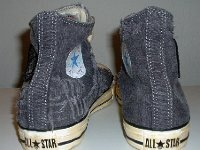 5 The Ramones High Top Chucks Outside view of a right Ramone's high top with hemp laces. 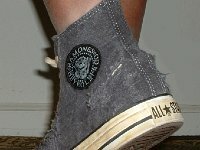 6 The Ramones High Top Chucks Rear view of Ramone's high tops with hemp laces. 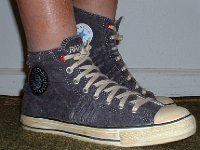 7 The Ramones High Top Chucks Front view of Ramone's high tops with hemp laces. 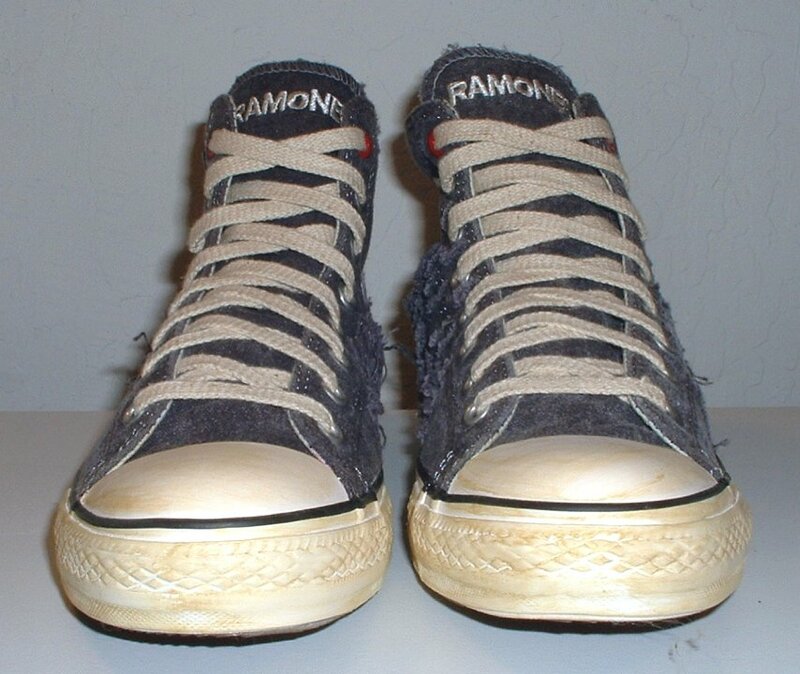 8 The Ramones High Top Chucks Angled side view of Ramone's high tops with hemp laces. 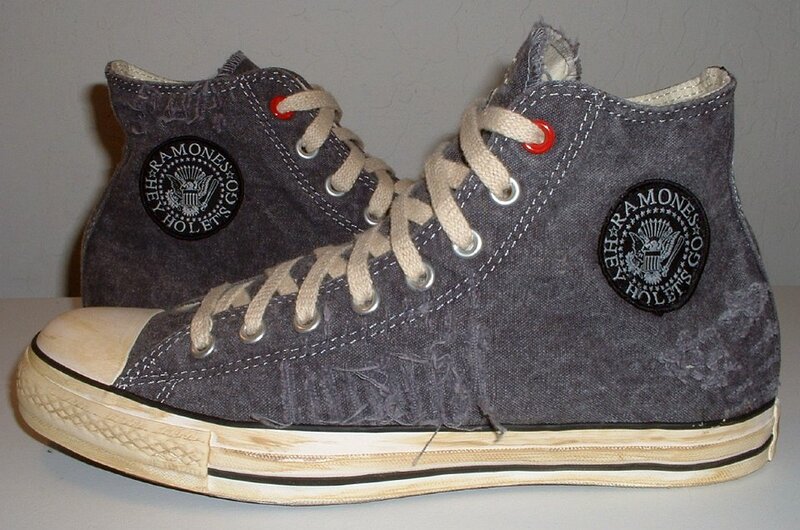 9 The Ramones High Top Chucks Angled front view of Ramone's high tops with hemp laces. 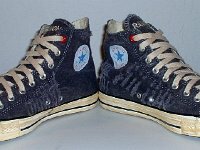 10 The Ramones High Top Chucks Top view of Ramone's high tops with hemp laces. 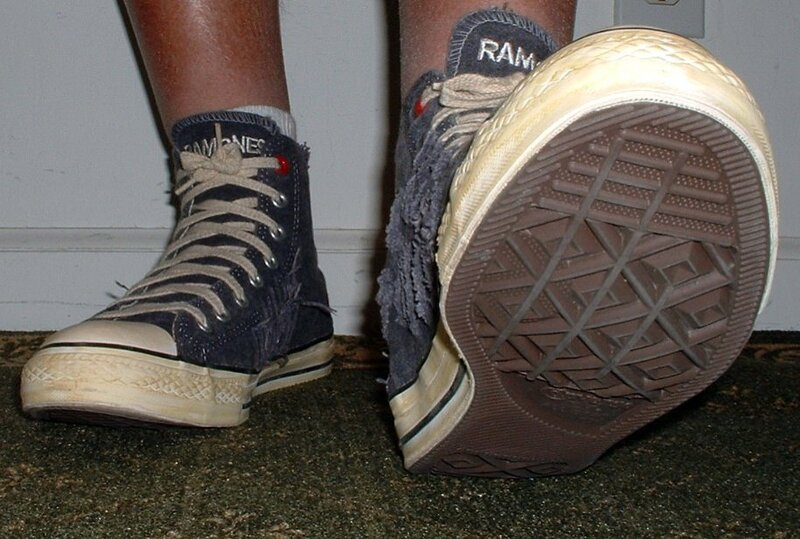 11 The Ramones High Top Chucks Inside patch views of Ramone's high tops with hemp laces. 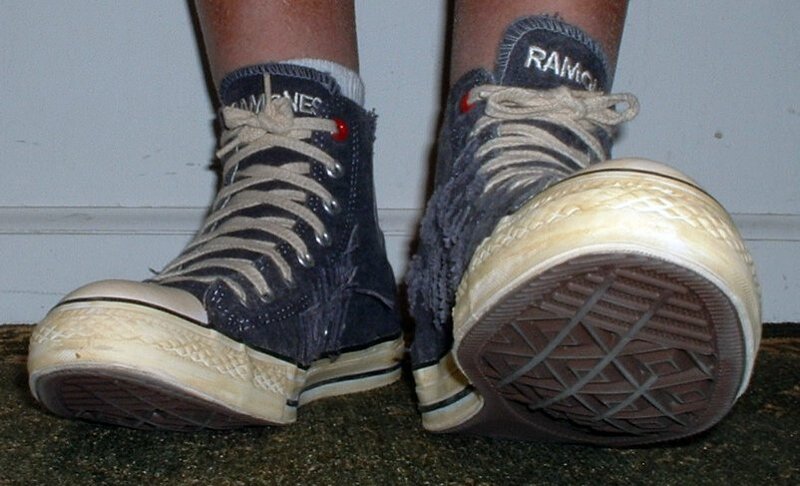 12 The Ramones High Top Chucks Outside patch views of Ramone's high tops with hemp laces. 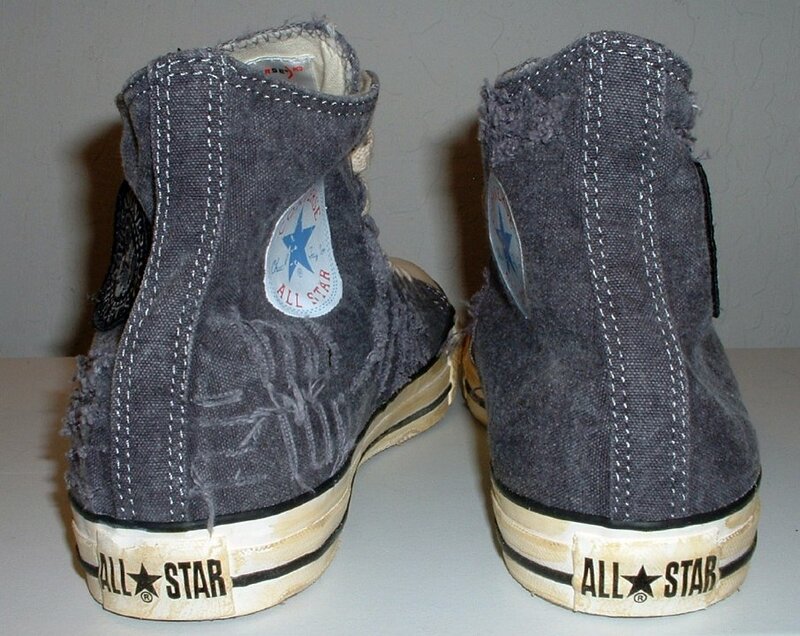 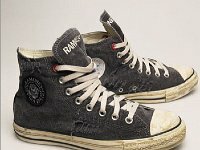 13 The Ramones High Top Chucks Closeup of the tongue of a Ramone's high top with hemp laces. 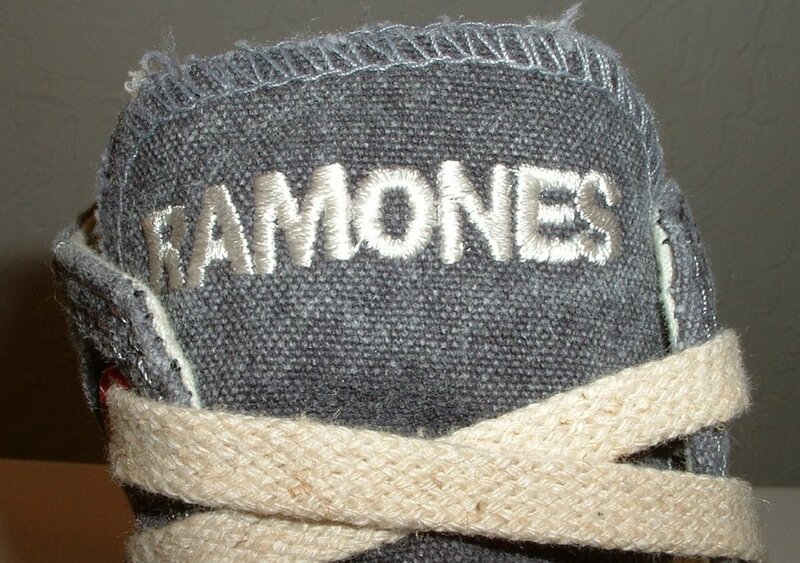 14 The Ramones High Top Chucks Closeup view of the outside patch on a Ramone's high top. 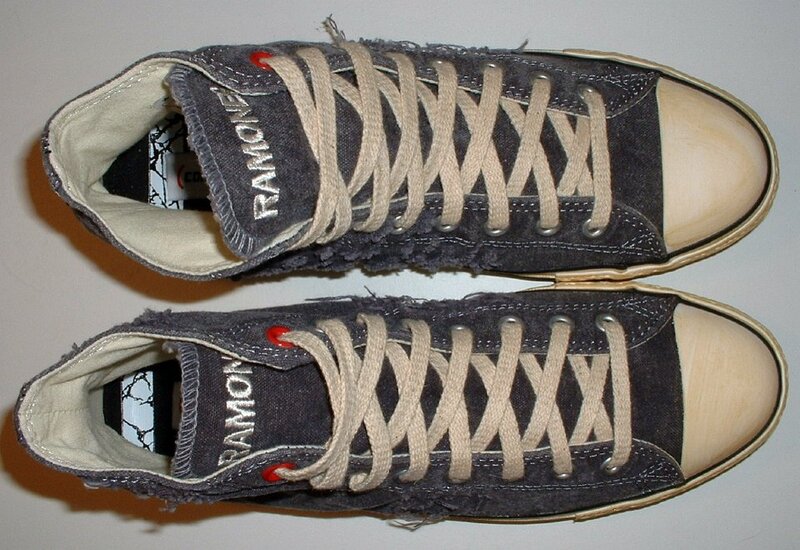 15 The Ramones High Top Chucks Outside patch and sole view of Ramone's high tops with hemp laces. 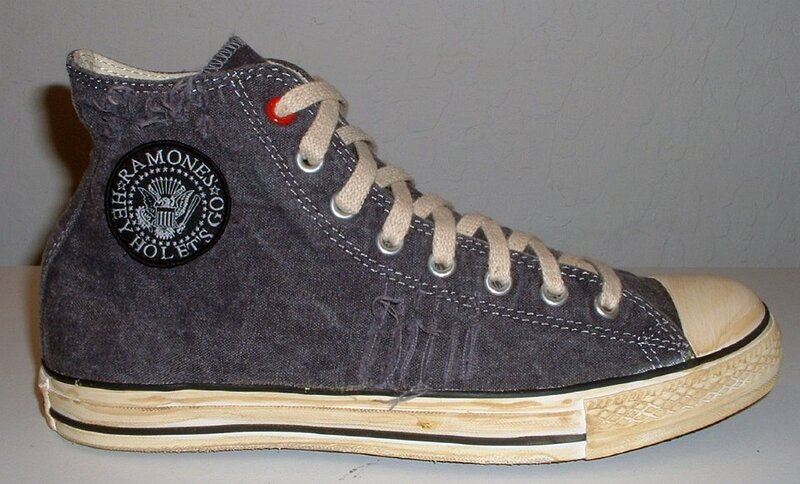 16 The Ramones High Top Chucks Inside patch and sole views of Ramone's high tops with hemp laces. 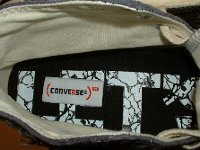 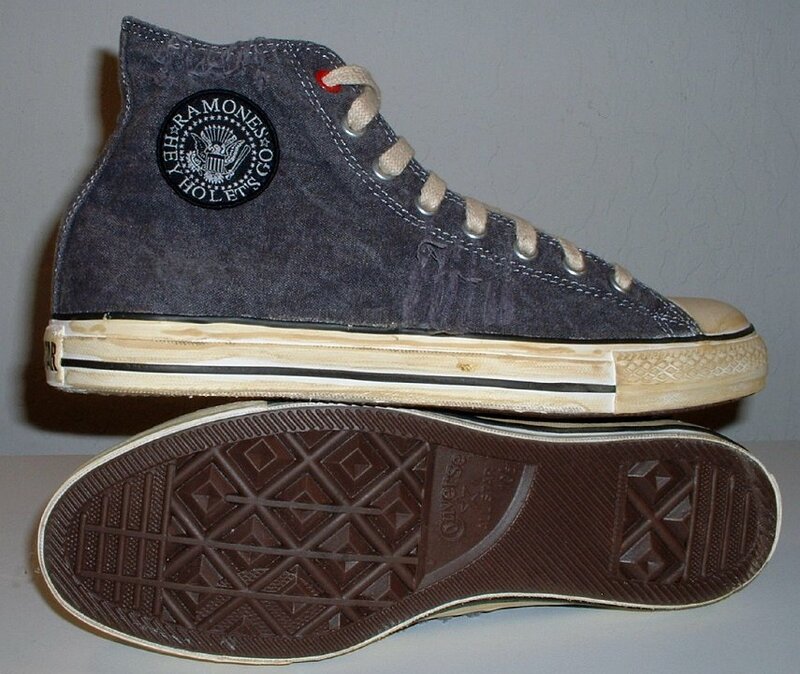 17 The Ramones High Top Chucks Inner sole view of a Ramone's high top. 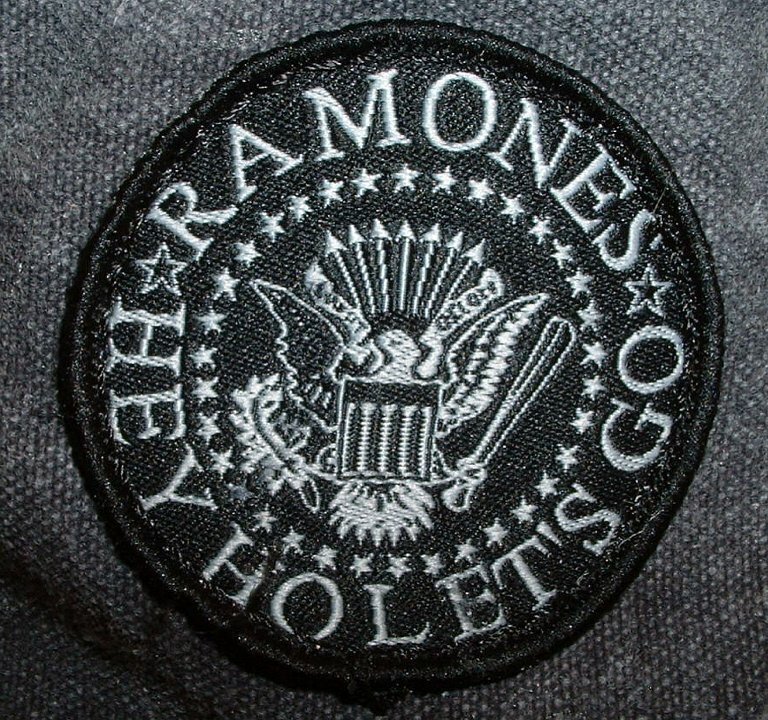 The lettering says "Let's Go". 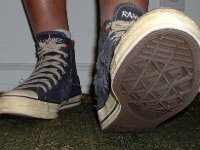 18 The Ramones High Top Chucks Stepping out in a pair of Ramone's high tops with hemp laces, front view. 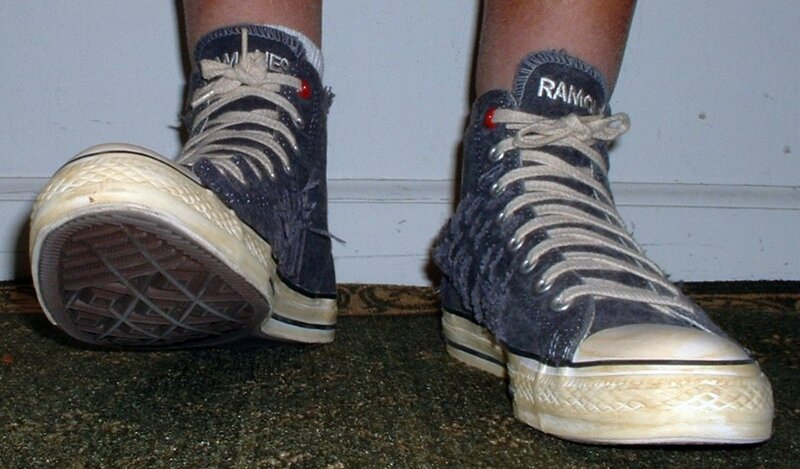 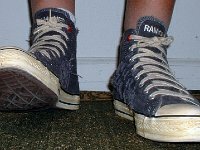 19 The Ramones High Top Chucks Stepping out in a pair of Ramone's high tops with hemp laces, front view. 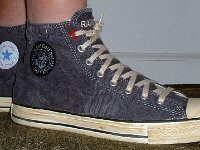 20 The Ramones High Top Chucks Stepping out in a pair of Ramone's high tops with hemp laces, front view. 21 The Ramones High Top Chucks Stepping out in a pair of Ramone's high tops with hemp laces, left side view. 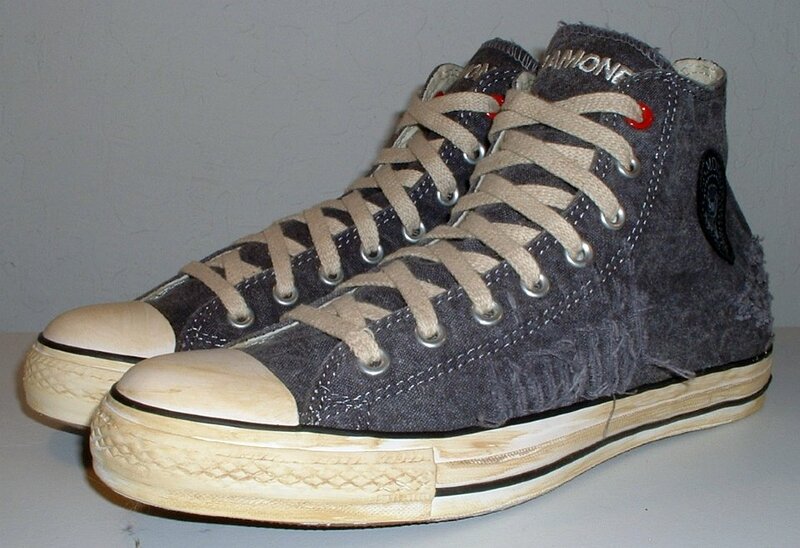 22 The Ramones High Top Chucks Stepping up in a pair of Ramone's high tops with hemp laces, left side view. 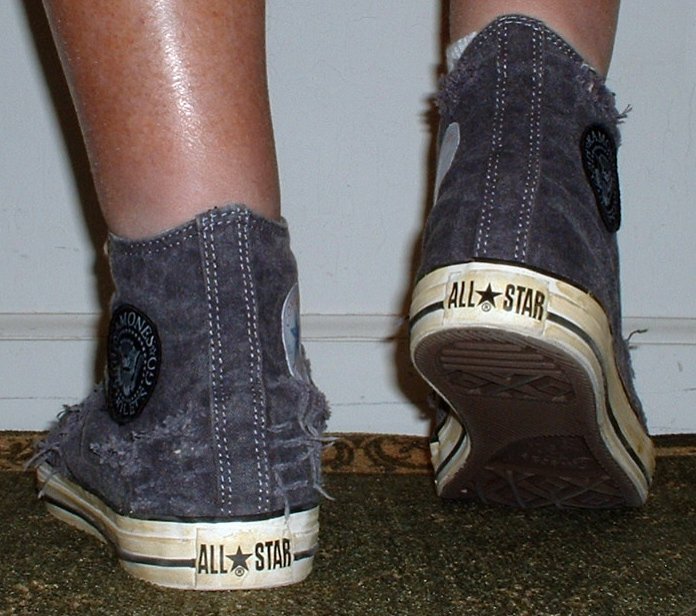 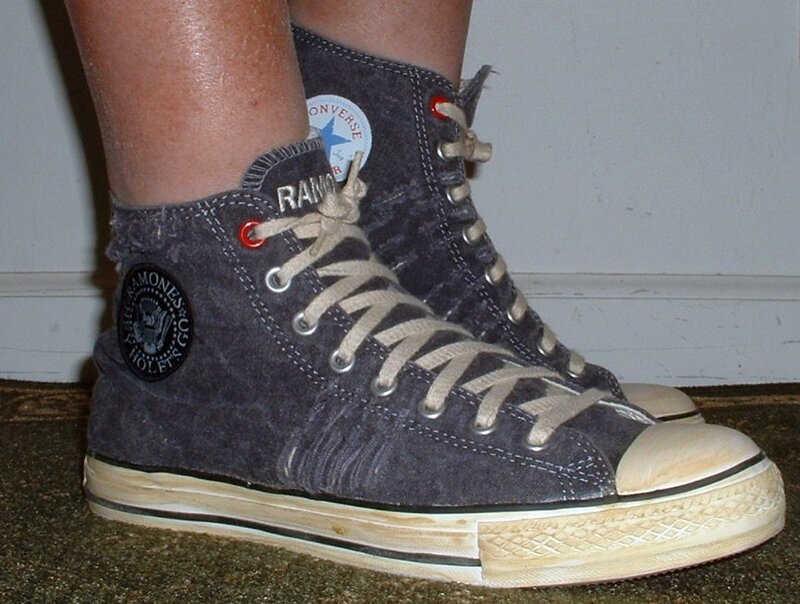 23 The Ramones High Top Chucks Stepping out in a pair of Ramone's high tops with hemp laces, rear view. 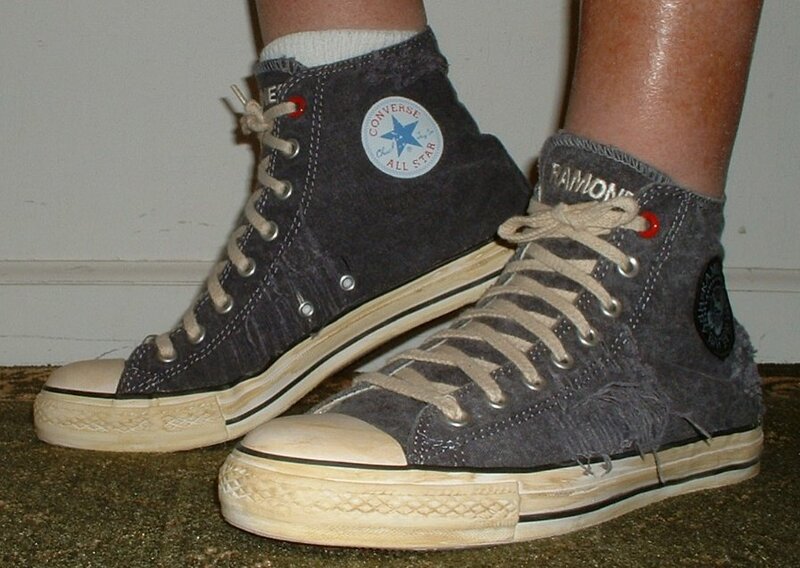 24 The Ramones High Top Chucks Stepping out in a pair of Ramone's high tops with hemp laces, rear view. 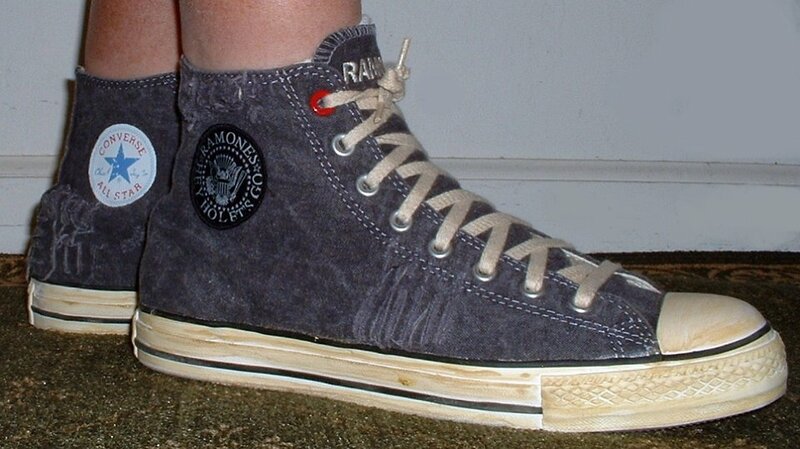 25 The Ramones High Top Chucks Stepping out in a pair of Ramone's high tops with hemp laces, right side view. 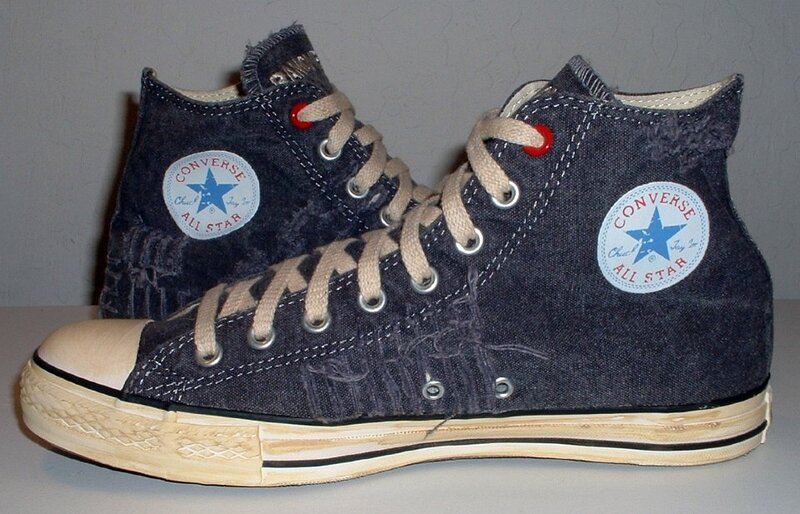 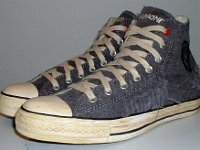 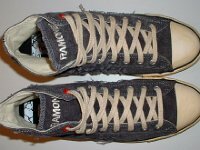 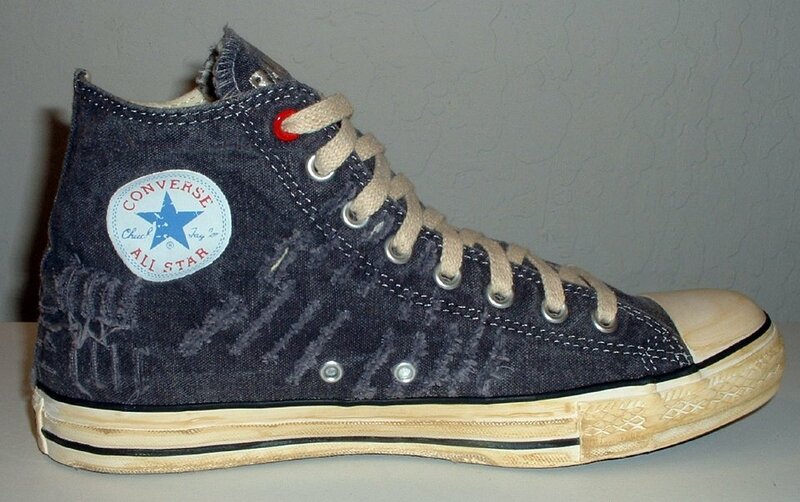 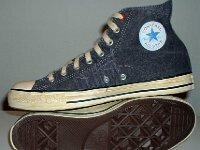 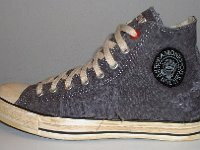 26 The Ramones High Top Chucks Standing in a pair of Ramone's high tops with hemp laces, right side view. 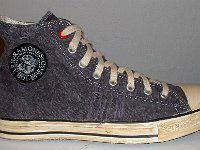 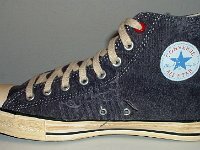 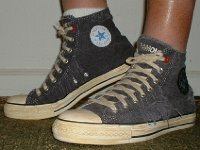 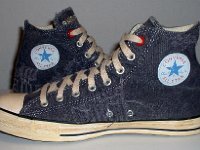 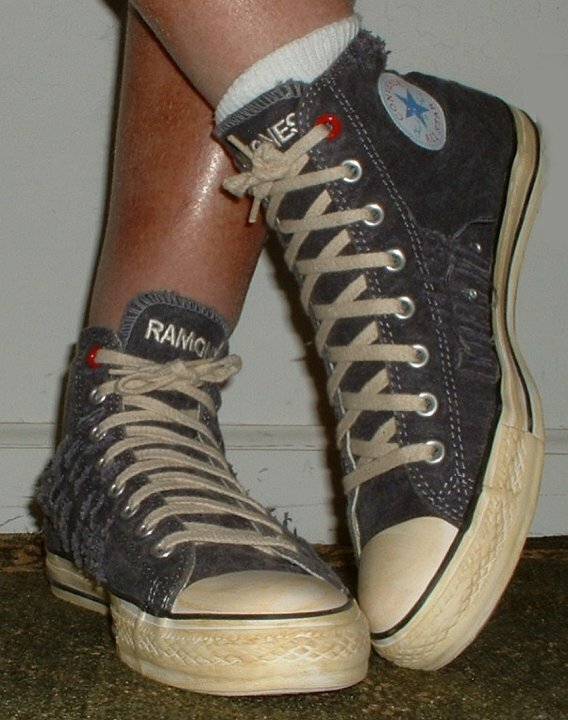 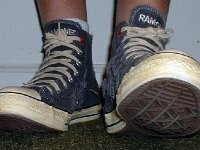 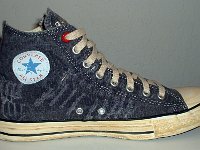 27 The Ramones High Top Chucks Standing in a pair of Ramone's high tops with hemp laces, front view. 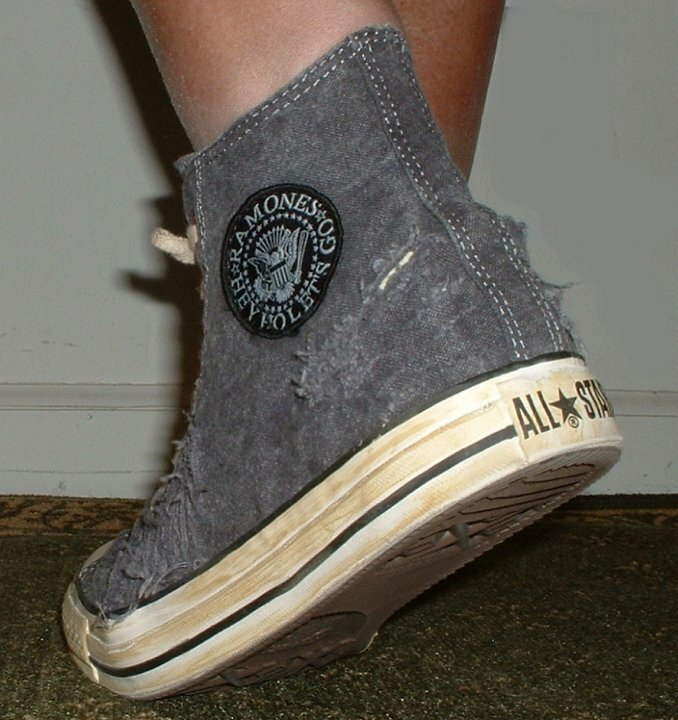 28 The Ramones High Top Chucks Angled side view of Ramones tribute high tops. 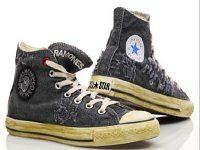 29 The Ramones High Top Chucks Right side views of Ramones tribute high tops. 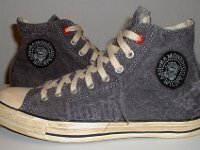 30 The Ramones High Top Chucks Ramones high top with insole insert. 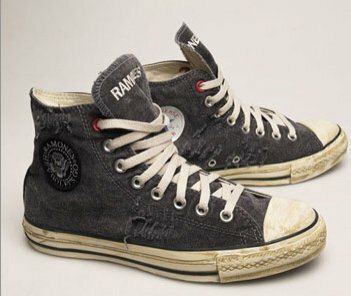 Ramones Distressed Black High Tops are both a tribute to the classic rock band known for wearing well-worn chucks and another Product Red campaign model. 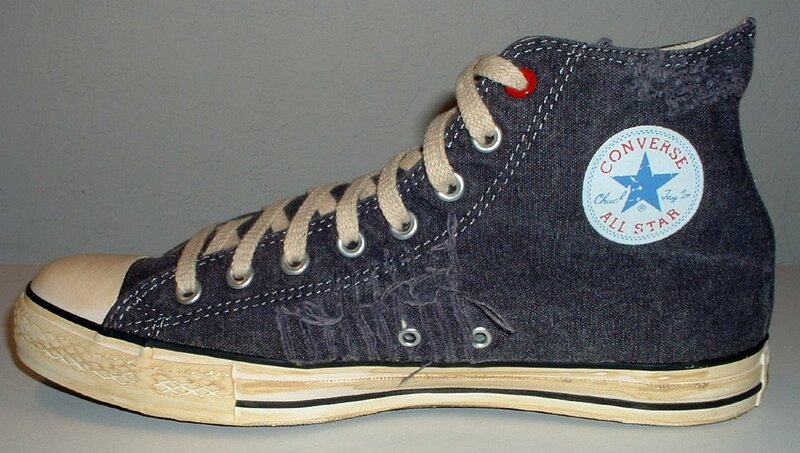 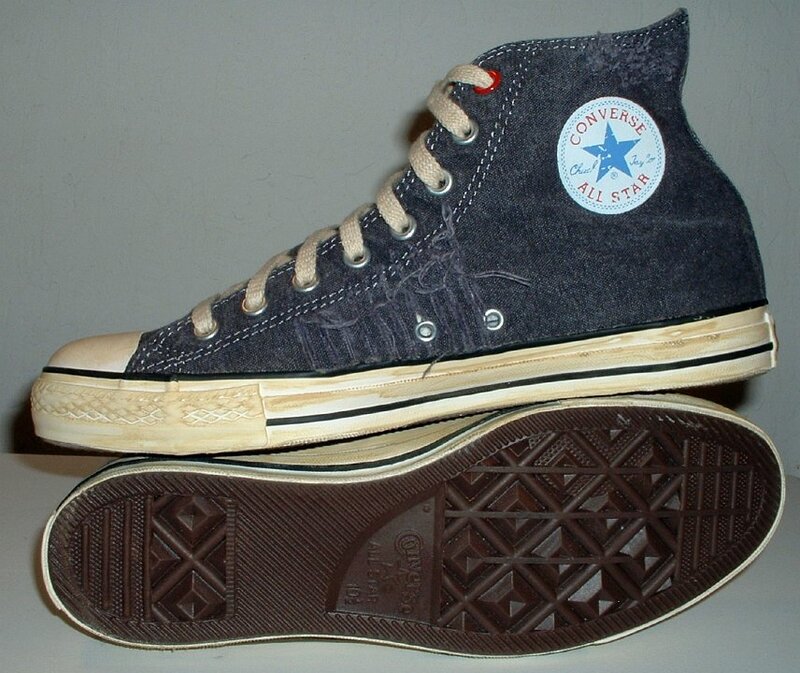 The shoes have faded black canvas uppers with some tears and loose threading, prefaded outer wrap and toe caps, and a scuffed and faded Chuck Taylor ankle patch like you see on distressed denim models. 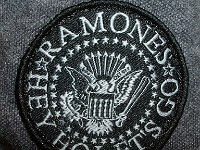 Special features include a Ramones embroidered ankle patch on the outside of each shoe, and the word "Ramones" embroidered on the tongue of each shoe. 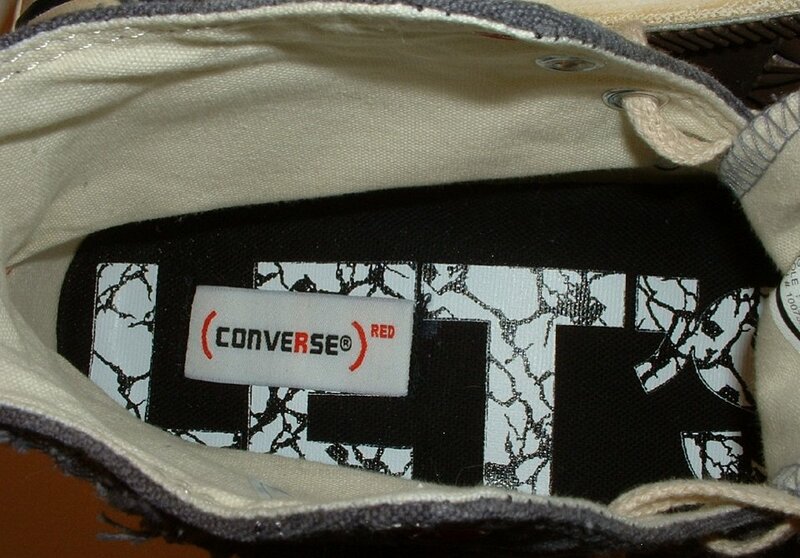 The inner soles even have their slogan "Let's Go" printed on them. 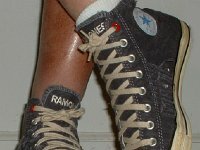 As a Product Red edition, the upper pair of eyelets on each shoe is red in color. 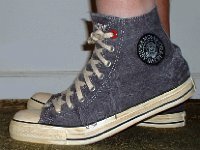 The shoes come with natural laces, but as the outer wrap and toe caps are a perfect match, this pair was appropriately outfitted with hemp laces.